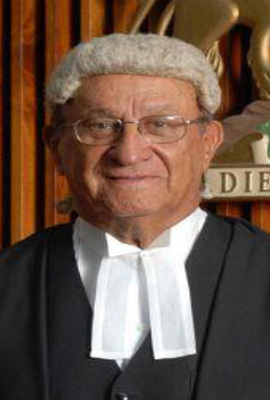 Justice Sir Edward Zacca, JA, OJ, was appointed in accordance with section 105 (1) (c). Sir Edward was Chief Justice of the Jamaican Supreme Court from 1985 to 1996 and in accordance with the Constitution of Jamaica as Chief Justice he served as Acting Governor General of Jamaica from March to August 1991. Sir Edward has had a long association with the Cayman Islands, beginning in 1967 when he presided in the Grand Court over one of the then rare murder trials. Prior to the establishment of the Cayman Islands Court of Appeal in 1984 he was a member of the Jamaica Court of Appeal which heard appeal cases from Cayman. He served as President of the Cayman Islands Court of Appeal from 1984 to 2008 and also served on the Bahamas Court of Appeal from March 2000 to July 2001. Sir Edward is currently President of the Bermuda Court of Appeal, a position he has occupied since 2004, having served as an appeal judge since 1996 in that jurisdiction. Sir Edward served as a member of the JLSC from 1 August 2010 to 31 July 2013 at which time he was reappointed to serve from 1 August 2013 to 31 July 2014 and again from 1 August 2014 to 31 October 2014.